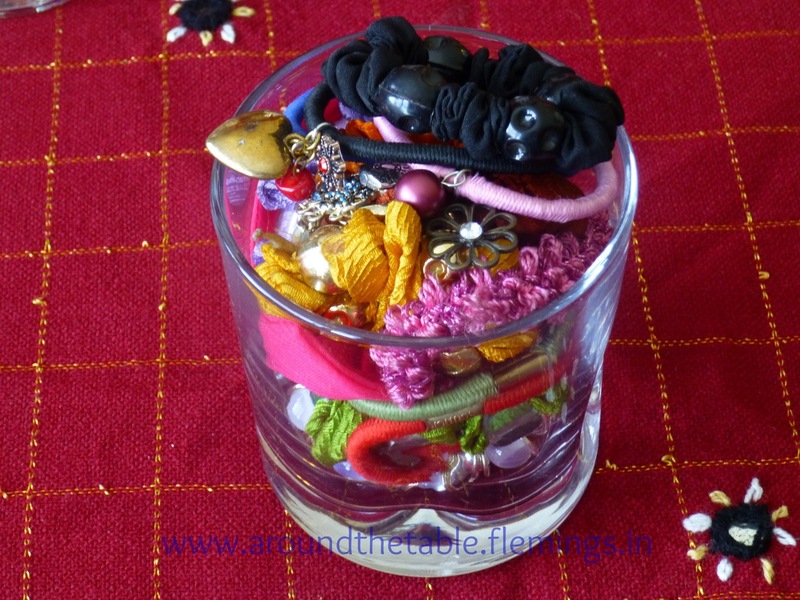 Around the Table Book: Half Full? Half Empty? Who Cares, All Dirty! Half Full? Half Empty? Who Cares, All Dirty! Strange as it sounds, one of the most annoying things was running out of drinking glasses. Every time we came home on furlough we landed on each set of parents for about three months. We weren't there all the time. The nature of a missionary furlough is travel, so we would be away a couple nights each week and many evening for meetings. But bringing a family of six into a household of two adults for that long--well our parents will definitely get their rewards in heaven! The little kids had their own Mermaid® or Thomas the Tank Engine® cups, but everyone else used the glass ones from the cupboard. To try to save on washing (and running out) several of us would have a spot on the kitchen counter "staked out" for our glass. But if the one straightening up didn't know whose was whose, it would get swept into the dishwasher, to avoid a bunch of empty glasses just sitting around. When all the glasses were in the dishwasher, we'd have to wash one out by hand to get a drink. That wasn't so hard, but if it was time to set the table for dinner, we might have to wash six or more glasses, which while not a real hardship, was just annoying. One person's solution was a piece of paper with her name on it. That became the "coaster" where she kept her glass--except when she moved it. Then her glass went into the dishwasher, too. After our kids grew up, we moved back to the states full time and they frequently come back home to visit, which we love! But it meant we had lots of people around. This past Christmas we had ten of us living in the house for ten days plus three others hanging around most of the time. The glass problem had moved on to another generation! I bought a variety of colored hair bands and charms from the clearance section of craft stores. I also used a clearance necklace with a a whole bunch of charms already on it and an earring that lost its partner. Another possibility would be gaudy old "bling" from thrift stores and garage sales. Using a pair of pointed nose pliers I fastened the charms to the hair bands. I also found some colorful scrunchies and otherwise decorated hairbands to add to the mix--trying to get some masculine enough for the men. When everyone came, they chose their favorite color or design for the duration of the visit, and put it on their glass. I still threw all the glasses in the dishwasher about once a day to avoid that fingerprint decor, but otherwise no one had to wash a glass before they could quench their thirst. Just one more way to make it easier to get the family together around the table! Thanks to those who took a minute to click on the "Vote for Us" button on the right (an up a little). This blog went from 900-something to 504 in the rankings in one week! Please keep it up and tell others about this blog if you think it is helpful and worthwhile. After all, there's no point in writing if no one's reading! Be sure to be back to read these topics coming up! March 5 -- Why Do We Have Kids Do Chores? Thanks so much, Lori, for the encouragement! Glad I could inspire you--that's my goal. I wonder if they have cute charm type things at the dollar store. I looked in Hobby Lobby and WalMart's clearance racks to start. This is such a fantastic idea! There are only three of us living at home these days, but I still somehow run out of glasses every.single.day. I'm definitely going to give this idea a try! Found you via the NY Melrose Family's link party. If you haven't already, I'd love if you'd come join my How To Tuesday link party, too. I'm glad you like the idea. It's been a real help to us. Those are so cute and so easy! What a great idea to keep track of whose glass is whose at a party. Thanks for sharing at Mom's Library! Do I spot an American girl pink bow elastic in there!?! Ha! We have a bunch of those from their cafe:) Thanks for sharing at Whimsy Wednesday- what a creative idea! It could be! Not sure where that one came from--my daughter or grandaughter. 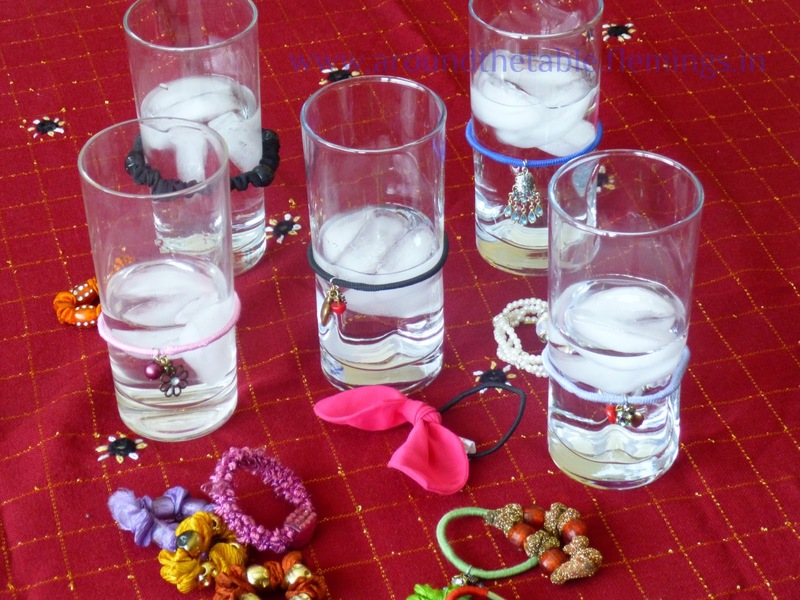 That's a great idea using hairbands and charms. I used to used different colored rubber bands but was limited on how many different combinations I cou use. Hi Sharon - Thanks for visiting and commenting about my 'Bird Pincushion Tutorial. Love your idea for drink glasses. We have a big family and the glass situation is something I know well about! Maybe this would work for you! We were always running out of glasses and my mother in law bought us a new box of them for Christmas and when we were unpacking them we found another entire box of the exact same glasses she must have bought us the year before that we completely forgot about. No shortage here anymore! What a great idea! With several grandkids at one home, we've had similar situations on my visits. They have a set of different colored glasses and assigning them to each grandkid. When I come to visit, though, they are short colors and I end up sharing a color with someone. This could be a great way of keeping track of mine vs. my grandchild. Thanks! Something about drinking out of someone else' glass...It's nice to know it's your own! I have this same problem every summer when we have all of our kids and grands here for a few days of family time. My solution wasn't near as creative as yours and they all laughed at me the first time I did it but now they know to expect it! I just write everyone's name on their glass with a Sharpie. It will eventually wash off with a scrubber but lasts the weekend. Though I prefer glasses I have accumulated a number of Tervis Tumblers from the thrift stores that get used that weekend since they like to carry their beverages all over the house and yard -- safer with non glass! Names on the glass works, too! And outside I do use either disposable or plastic. I am inspired and we are going to take this one step further! Amara's 9 birthday is coming up and will probably be a slumber party and last year glasses were an issue and I don't want them going through a lot of plastic ones either. This could be a great idea as a party craft, too! They could make their own glass charms! Thanks! Glad I could inspire you to go a step further! Inspiring is my goal! Hope they have a fun time!. Doing your granddaughter's birthday party--slumber party!--is going above and beyond! Have fun! Good idea. For Christmas Eve this year we used large disposable cups and wrote names on them with a sharpie. It was nice for the evening and then we could throw them away. After we used the goblets for Christmas dinner, we pulled out the solo cups again for the rest of the day. Great idea. We usually write names on our disposable cups at parties and such. I love using my wine charms ... Didn't think about it for actual glasses. Clever. I love these type of ideas. I do some jewelry-making, and it's always fun to see how to use beads and charms apart from just jewelry. Thanks. clever idea! & love the recipe too. thanks for linking up @ DearCreatives.com & hope your having a great week. this is a great idea for water bottles at events. People are always trying to keep track of their bottles at parties and picnics. Dollar store, here I come! Love these ideas. My son got so annoyed that we never had enough drinking glasses, that he finally bought us a set of 12. But, when you have lots of people around for days, you can't just grab a clean glass every time. Thanks for a solution.